Homemade deep fried egg tofu is one of the most popular dish at almost every restaurants around the region. Almost every restaurants I've been to will recommend their signature golden deep fried egg tofu dish. Well, I had finally came to make mine own as well. (1) beat the eggs, salt and soy milk together untill well mixed. (2) stir in the thickening and mix well. (3) pour mixture to a 7" tray lined with aluminium foil. (4) then cover the top with the seaweed sheet. (5) steam for 20mins in a preheated steamer over super low heat. Keep an eye on the mixture after 10 mins and check on it another 10 mins later if the middle is set. (6) remove the tray from steamer once its ready. Leave to cool completely before slicing it. (7) preheat a frying pan or wok with cooking oil. 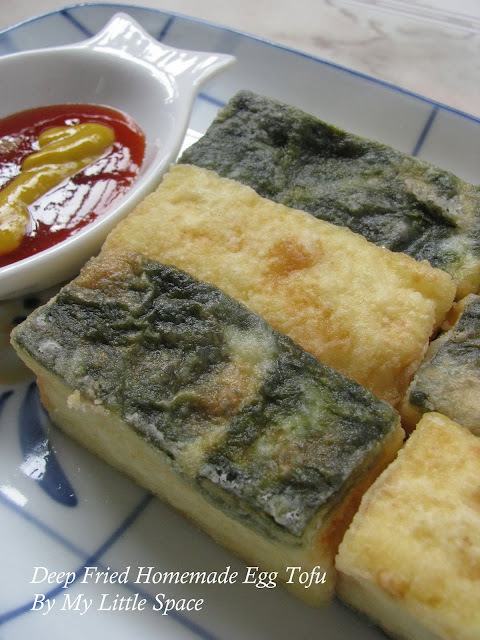 (8) coat the egg tofu with flour mixture and then fry untill golden brown over medium heat. Fried them over medium heat will help to maintain the crispiness of the crust for a little while longer. 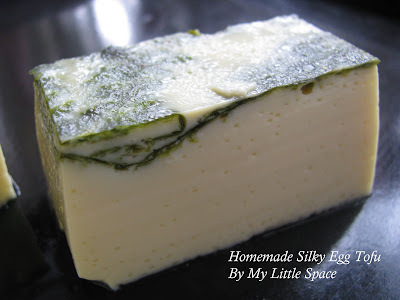 Did you notice the silky mirror surface of the homemade egg tofu? 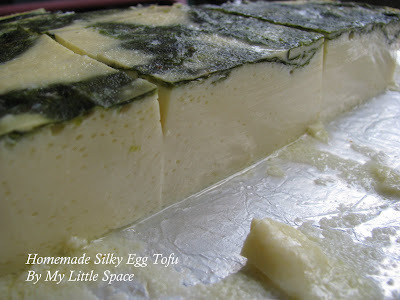 The egg tofu looks so presentable with the addition of seaweed sheet as well. Even a simple decoration does make a big difference. Enjoy! I really like tofu-especially, when someone else prepares it. I have never done well preparing it myself. This looks awesome. Very delicious. Seriously - so delicious and simple and healthy!! Beautiful. Yes I noticed the silky suface of your homemade egg tofu! It's beautiful, and I am sure the best tasting around!! Great job, it looks so tempting! Very interesting recipe, you always come out with something new and special...awesome! great job with this one its hard to make this one taste good to me... I think youve done it! You're too GOOD in the kitchen! You even made tofu yourself, WOW! Thumbs up, Kristy :D)! I like the touch of seaweed, very nice! una torta exquisita,se ve fabulosa y con la salsa mucho más,,hermoso color,me encanta,cariños y abrazos. Your tofu looks wonderful... I never thought to make it at home! This looks fabulous, Kristy. I've never done anything with tofu at home and really am not overly fond of it, but I'd sure love to be in your kitchen to try this! Oh wow, nothing beats homemade, but homemade tofu! Really impressive Kristy, plus it looks really soft and smooth. The seaweed top is a great idea, I think my kids will love it! Ok, will try making it soon, thanks! Alice : Hope your kids are fine now. Emily : All the bste, girl! Lyndz : I'm glad I can read the timing now. Pefect timing make gorgeous tofu. Oh, and the steamer temperature may also effected the whole process too. Too hot, the outer layer cooked too soon and the centre is not done yet. divya : Thank you very much, dear. Shaz : this is egg tofu not the commercial white tofu, so we don't need any setting agent. Shirley : Hey, wish you all the best. Rebecca : Thanks so much. You think Jasmine will love this too? Shaz@ : Hopefully, your family will enjoy it. Little Inbox : Thank you! Yummy Bakes : Thanks! Glad you like it too. Blue Wale : Explore when I still can! Time is precious. Cheah : No problem! Just omit it. Sutapa : Thank you! Hope you will like it too. Penny : You're welcome! Hope you'll enjoy it. Yummylittlecooks : You're welcome! Have fun. Claudia : Thank you! Wish I could share some with you. Ann : Thanks! It does made such a great difference, right! Rosita : Esto no es un pastel pero nata que se elabora con leche de soja y huevo. Es muy popular aquí en Malasia y Singapur. Espero que le gusta demasiado. Nourhan : Hi there, welcome to my humble little space. Hope you willl ike it here and would love to hear from you more often. Lucia : Maybe you should now! :o) Enjoy & have fun! Barbara : haha...Well then, I think I should someday try to make this in Your Kitchen! What do you say? Bee : Have fun! I'm sure you will enjoy it very much. It's easy & quick. And the kids may also love eating it with some relaly nice sweet sauce too. Thank you everyone for spending your time here with me. Hope you will enjoy today's recipe and have fun with it. Have a fabulous day, guys! aiyoh, kristy..i love all your homemade..i think one day you dont have to go marketing already!!haha! Thks, Kristy for sharing yet again another wonderful recipe! :)I made a batch today - too lazy to make soybean milk from scratch, ( ie unsweetened fresh soybean milk not available in Perth ) so i bought a box of unsweetened organic soybean milk. My family love the taste and texture - beats commercial egg tofu hands down! Hi do u know how long I can keep these tofu in the fridge?lov to try ur recipe..u made it sound so easy n yet 5*! !